, the triumvir, was son of Antonius Creticus, by Julia, a noble lady of such merit, that Plutarch affirms her to have been " comparable to the wisest and most virtuous ladies of that age; but she was by no means happy in her husbands; for, after the death of Antonins, she married P. Cornelius Lentulus, an accomplice in Catiline’s conspiracy, and punished with death for that crime. She was also as little fortunate in her sons, who were three; for Caius and Lucius seem to have had (Lucius especially) all the vices of their brother Marcus, without any of his virtues. Anthony, losing his father when young, launched at once into all the excess of riot and debauchery, and wasted his whole patrimony before he had put on the manly gown. His comely person, lively wit, insinuating address, made young Curio fond of him, who involved himself on his account in a debt of 50,000l. 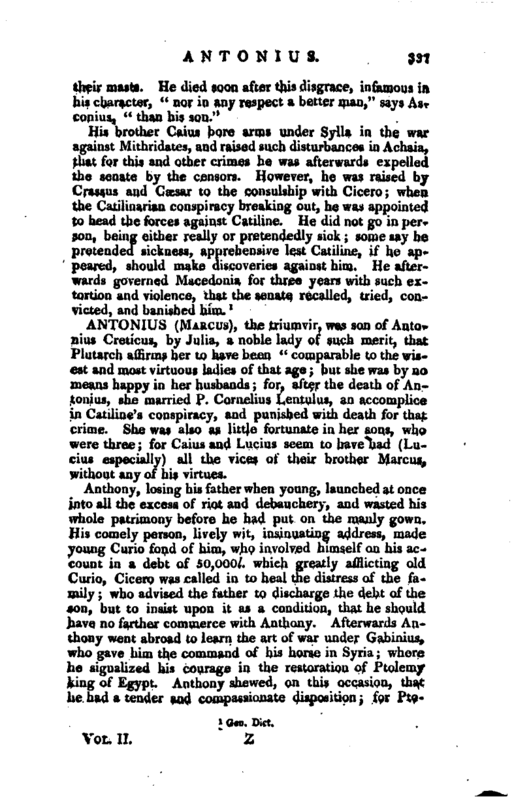 which greatly afflicting old Curio, Cicero was called in to heal the distress of the family; who advised the father to discharge the debt of the son, but to insist upon it as a condition, that he should have no farther commerce with Anthony. Afterwards Anthony went abroad to learn the art of war under Gabinius, who gave him the command of his horse in Syria; where he signalized his courage in the restoration of Ptolemy king of Egypt. Anthony shewed, on this occasion, that he had a tender and compassionate disposition; for | Ptolemy was so enraged at the inhabitants of Pelusium for their revolt, that they had all been put to death by his order, if Anthony’s intercession had not saved them. He performed afterwards some noble exploits, which gained him high reputation as a commander. From Egypt, instead of coming home, where his debts very probably might not suffer him to be easy, he went to Caesar into Gaul; and after some stay there, being furnished with money and credit by Caesar, returned to Rome to sue for the questorship. In this suit he succeeded; and afterwards obtained the tribunate; in which office he was zealously active for Caesar. But finding the senators exasperated against this general, he fled in disguise to Caesar’s camp; complaining, when he arrived, that there was no safety at Rome, nothing right done there, and that the tribunes could not perform their office but with danger of their lives. Caesar upon this marched immediately into Italy, which made Cicero say, that Anthony was “as much the cause of the ensuing war as Helen was of that of Troy.” But this was said in a professed invective, which must not be interpreted too literally: the flight of the tribunes gave Caesar a plausible pretext for beginning, and seemed to sanctify his attempt; but his real motive, as Plutarch says, was the same that animated Cyrus and Alexander to disturb the peace of mankind the unquenchable thirst of empire, and the wild ambition of being the greatest man in the world, which was not possible till Pompey was destroyed. Caesar, having made himself master of Rome, gave Anthony the government of Italy, with the command over the legions there, and he gained the love of the soldiery; to preserve which, he used to exercise and eat with them, and make them presents when his circumstances permitted. But what was more to his honour, he assisted Caesar so successfully on several occasions, that twice particularly, when Caesar’s army had been put to flight, he rallied the scattered troops, and gained the victory; this raised his reputation so much, that he was reckoned inferior only to Caesar. After the defeat of Pompey at Pharsalia, Caesar, as an acknowledgment of Anthony’s great services, made him master of the horse, but in this office he behaved most oppressively. For though he assembled the senate, and maintained a shadow of liberty, yet he exercised himself upon all occasions arbitrarily and tyrannically; and this | behaviour, together with his dissolute life (for he was debauched to the last degree), was the reason, as Plutarch says, why Caesar the next year did not admit him his col-, league in the consulship, although he admitted him two years after. This was what Anthony continually aimed at; and, as the event shewed, he pursued his measures with the greatest address. He artfully proposed a decree for the confirmation of Caesar’s acts; and getting Caesar’s register into his power, proposed as Caesar’s acts whatever suited his purpose. He procured a public funeral for Coesar, and took that opportunity of haranguing the soldiers and populace in his favour, and inflamed them so against the conspirators, that Brutus and Cassius were forced to leave the city. He made a progress through Italy, to solicit the veteran soldiers, having first secured Lepidus, who had the army, to his interests; he seized the public treasure; and he treated Octavius, upon his arrival, with superciliousness and contempt, though the adopted son and heir of Julius Caesar. 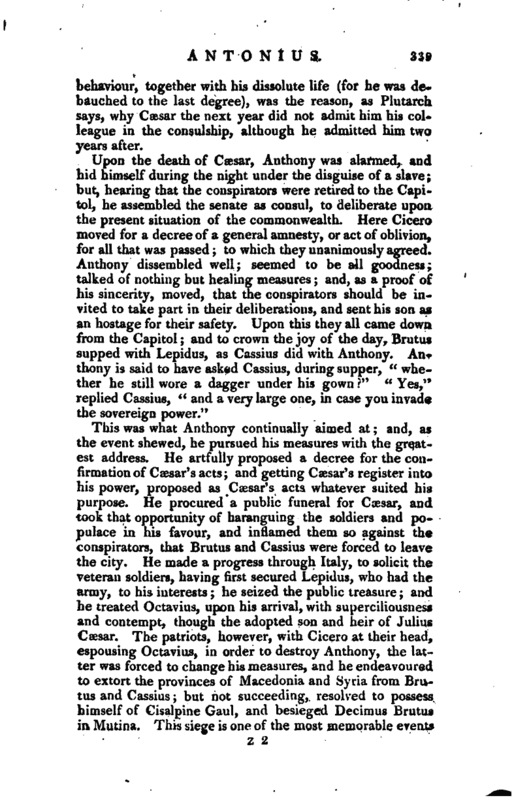 The patriots, however, with Cicero at their head, espousing Octavius, in order to destroy Anthony, the latter was forced to change his measures, and he endeavoured to extort the provinces of Macedonia and Syria from Brutus and Cassius; but not succeeding, resolved to possess himself of Cisalpine Gaul, and besieged Decimus Brutus in Mutina. This siege is one of the most memorable evejnts | of the kind in history, and in conducting which Anthony, though defeated, gained great reputation; the consuls Hirtius and Pansa were both slain; and nothing but superior force could have left Octavius master of the field. Anthony fled in great confusion, wanting even the necessaries of life; and this very man, who had hitherto wallowed in luxury and intemperance, was obliged to live for some days upon roots and water. He fled to the Alps, and was received by Lepidus, with whom, and Octavius, he formed the second triumvirate, as it has usually been called. When these three conferred, they would easily be persuaded, that the patriots wanted only to destroy them all, which could not be done so effectually, as by clashing them against one another. They therefore combined, proscribed their respective enemies, and divided the empire among themselves. 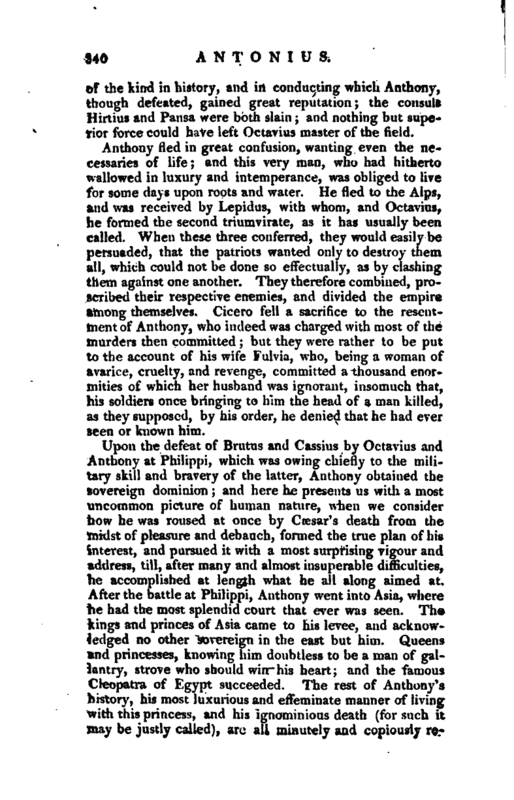 Cicero fell a sacrifice to the resentment of Anthony, who indeed was charged with most of the murders then committed; but they were rather to be put to the account of his wife Fulvia, who, being a woman of avarice, cruelty, and revenge, committed a thousand enormities of which her husband was ignorant, insomuch that, his soldiers once bringing to him the head of a man killed, as they supposed, by his order, he denied that he had ever seen or known him. Upon the defeat of Brutus and Cassius by Octavius and Anthony at Philippi, which was owing chiefly to the military skill and bravery of the latter, Anthony obtained the sovereign dominion; and here he presents us with a most uncommon picture of human nature, when we consider how he was roused at once by Caesar’s death from the midst of pleasure and debauch, formed the true plan of his interest, and pursued it with a most surprising vigour and address, till, after many and almost insuperable difficulties, he accomplished at length what he all along aimed at. After the battle at Philippi, Anthony went into Asia, where he had the most splendid court that ever was seen. The kings and princes of Asia came to his levee, and acknowledged no other sovereign in the east but him. Queens and princesses, knowing him doubtless to be a man of gallantry, strove who should win his heart; and the famous Cleopatra of Egypt succeeded. 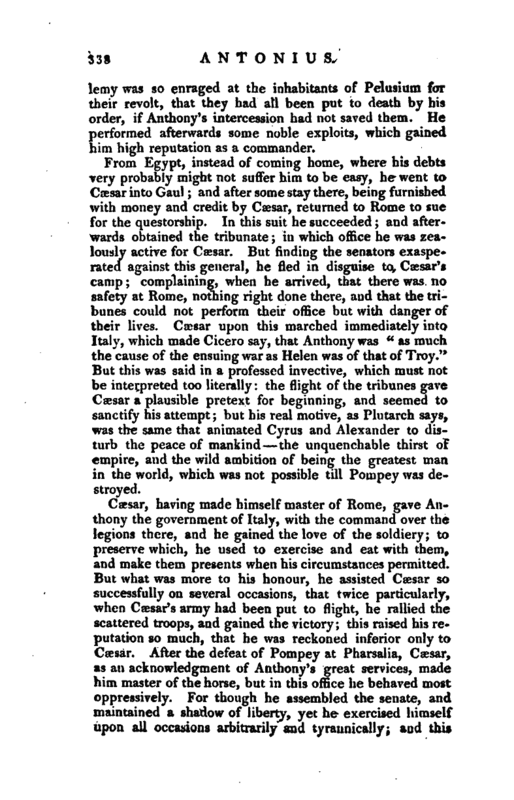 The rest of Anthony’s history, his most luxurious and effeminate manner of living with this princess, and his ignominious death (for such it may be justly called), are all minutely and copiously | reluted in the article of Cleopatra, to which we refer the reader. 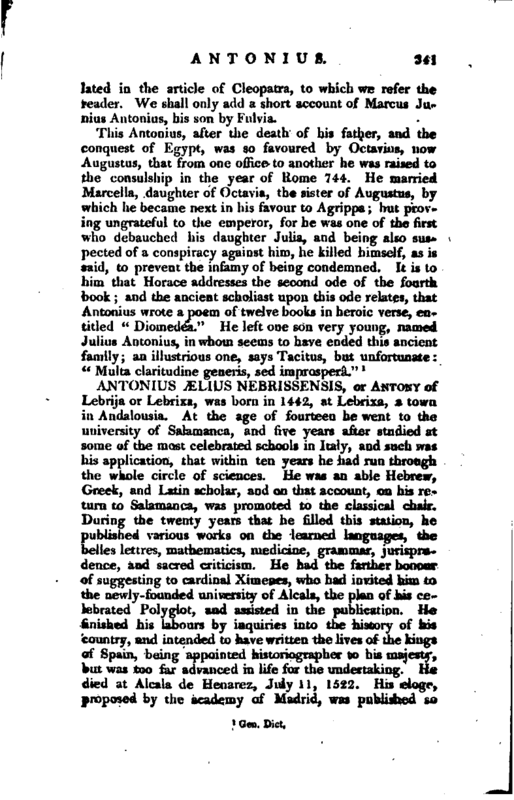 We shall only add a short account of Marcus Ju-' nius Antonius, his son by Fulvia.